For die-hard foodies, the best give you can give is one that indulges their interests and their stomach. This list of gifts is sure to keep him satisfied – and filled. From gifts that are just for him, to those that can be shared, this list has something for all occasions, though sharing is optional. A griddle pan can quickly transform a dish, adding that just-barbecued chargrilled taste, without the need to head outside into the cold. Even in the dead of winter, during the festive season, he can still enjoy the flavors of outdoor cooking. When he’s got the whole gang round to watch the game, or for poker night, nothing could be better suited than this bumper box of roasted nuts. Containing 7 different types of nuts, it is the perfect accompaniment to a cold beer. There’s hungry and there’s angry, but nothing is worse than a hangry man. In case of a hunger-related emergency, he’ll need this care package, which is sure to tackle any appetite quickly. Make sure you remind him that it’s for emergencies and not just for breakfast. If he loves soda, then he’ll be thanking you for this gift for years to come, as it’ll save him hundreds of dollars in the long run. Being able to make his own soda at home will be a blast, and it also means no more long hikes to the store for a big gulp. Dessert after Christmas dinner is sorted, with a chocolate fountain that can melt up to 4 pounds of chocolate. The choice of dippers is really up to him; strawberries, bananas, pretzels, donuts, cookies, the list goes on. He’ll want to get this out every day, but this gift is truly made for sharing. The only thing better than a hefty sandwich is one that’s been grilled to perfection. The De’Longhi panini press can accommodate any sandwich he crams into it, with its adjustable hinge and double-sided contact plates. He’ll never want a cold sandwich again. These ice cream soda glasses will have his kitchen looking like a 60s diner in no time. They’re completely suited to creating smoothies, milkshakes, beer floats or a Knickerbocker Glory. There are 6 in the set, just in case he decides to share. Every grill chef should have a pair of these gloves. They’ll withstand heat of up to 932°F, keeping him protected against any unfortunate accidents. With silicone grips padding each finger, he’ll still be able to open jars or dish out plates to the rest of his buddies. For the man who’s serious about his food, comes this trivia game for true foodies. If he thinks he’s the king of carbs, the buff of beef, or the champ of chips, then he now has a way to prove it, with this range of over 1,000 food-related trivia questions. With this kit, he’ll be able to brew up a full bottle of his own homemade gin. Not only does he gain the satisfaction of enjoying his own home brew, but he’ll also gain the knowledge of how to knock together his own booze any time he wants to. Cheese and biscuits make the perfect finisher to Christmas dinner. The stainless steel blades and bamboo wood finish will add a touch of style to any dinner party, when he has guests over. Giving him a selection of cheese with this gift is optional. Buying a bottle of red to go with it is mandatory. Anyone can buy pre-packed bacon, but with this gift, he’ll never wanted to settle for store-bought pork again. By curing his own, he’ll be able to control the sugar content and marinades used, creating the perfect cuts of meat for his breakfast or sandwich. When friends and family visit, and you’re putting on a huge spread, it’s all too easy to run short on pots large enough to cook for a crowd. If he has this huge, 14-inch cast iron wok, then he’ll always be ready to feed a small army. For the man who has a tight-knit group of friends or large family, the Char-Broil Gas Grill is not short on grill space. There’s tonnes of space for burgers and hotdogs, a side burner for sauces and sides, and a warming rack for corn. This grill will take center stage at any BBQ party. A homemade pizza kit is an awesome crowd-pleaser, and a great way of filling an hour or two with friends or family. Forget waiting an hour for a pie to be delivered; give him the tools to create his own instead. They’ll be far fresher and more satisfying. Cooking is serious business, especially in a busy household, so he needs to look the part. Whether he’s a catastrophe of a chef, or has a whole bunch of kids running riot, this apron will make sure he’s the authority in the kitchen, and is protected against any unexpected flash mobs. Everyone has a refrigerator these days, but not everyone has the Igloo Erase Board Refrigerator. He can chalk up whatever he likes on the fridge door, with the neon markers and chalkboard making it a breeze to remember those tricky recipes, or the grocery list for the store. Having a healthy dessert maker in the home is a godsend. If he’s a big fan of dessert and just can’t help reaching for those sweet snacks after a hearty dinner, then this machine will at least take some of that guilt out of eating dessert, as it produces healthier treats. S’mores don’t have be reserved for camping trips or fires in the backyard, they can be brought indoors with this s’more maker. This kit includes everything he’ll need to get the heat going and create as many of these delicious treats as he can eat. Anything can be an excuse to eat, even time with the partner or wife. With this edible body paint, he can enjoy their time together, whilst enjoying something sweet. Or, if he’s single, it’s just a great excuse to eat in the shower. Crafted from natural wood, this tray has a brass inlay design and will really wow his guests when he brings out the goodies at a party. Of course, it’s also the perfect way for him to enjoy his own man-sized feast at home. If he’s in charge of cooking the turkey this Christmas, then make sure it’s done right, with this digital cooking thermometer. With an accurate LCD display built in, there will be no excuse for under or overcooking the meat. For men who are wizards in the kitchen and masters of their own indulgence, a dull knife just will not do. When there’s food to be chopped, sliced or diced, it pays to have the right tools for the job. This ultra-sharp blade will cut through even the toughest proteins like butter. Is he sick of walking to the store when he’s hankering for some jerky? Does he hate waiting days to create some of his own at home? The Jerky Xpress is the perfect solution, drying food within hours, so that a salty snack is never far away. If he’s a coffee lover as much as a foodie, then this treasure chest is an awesome bounty for him to revel over for months to come. Packed with a whole heap of different, specialty coffees, he’ll certainly be running on full capacity with a cup of morning joe from this treasure haul. There’s no excuse for creating a bad burger if he’s given this gift. With plenty of time left to go until summer, he has all the practice he needs, and the included eBook will guide him on the way to creating the ultimate party food, just in time for grilling season. Take a break from the conventional brands packed onto the store shelves and give him this selection of homemade hot sauces. These sauces pack a small kick, but they’re all about the flavor. The perfect accompaniment to grilled meat. Whether he’s traveling in the car, or off to work, this travel tumbler will keep his liquids safe. His hots will stay hot, and his colds cold. This isn’t just great for that much-needed large cup of coffee in the morning, but also for lunchtime soups or stews. Using a large, standing blender to do your mixing and chopping can be cumbersome. They’re tricky to get clean and don’t always blend even. With a hand blender, he’ll get the job done much more quickly, and can focus on enjoying his food rather than cleaning up. Kabob skewers have tonnes of uses for food lovers. He can skewer meat and veg for a grill party, fruit for the kids, cheese and pineapple for dinner parties, or create makeshift s’mores with marshmallows and chocolate. With 6 in the set and 17” long, there’s plenty to go around. Give him the gift of choice with this set of 5 gourmet spices. He’ll truly be able to spice up his grilling game using these jars, giving him something different for every day of the week. Best of all, they’re low in salt, meaning he can eat more, guilt-free. Gone are the days of having his pancakes all stick together in the pan. This pancake pan keeps them all separate whilst they cook, guaranteeing a clean stack every time – until he heaps on the maple syrup. Good for large families, or men with large appetites. Every ninja needs a good hearty diet to keep his strength up, but you don’t need to be a ninja to work magic with this set of Samurai kitchen knives. They’re still a great excuse to cook a hearty meal from scratch, so if he’s a budding chef in the making, they’ll make an ideal gift. This is a real time-saver in the mornings, dispensing all of the cereal he needs to start the day with a good breakfast. Alternatively, why not buy two, so that he has one on his office desk, too. Nobody wants their car full of crumbs or trash, but it’s all too easy for it to build up on long road trips. Whether it’s the kids tearing through packets of chips, or he’s just a big eater out on the open road, this trash can will keep his car tidy and free from old food odors. There’s nothing wrong with rolling pizza cutters, but sometimes they’re just not fast enough when you want to tear into your pizza without any hassle. With this large rocker blade, it’s as simple as making a couple of quick, clean cuts, and getting into that gooey cheese as quickly as possible. Having a fondue set in the home essentially means being able to cook and eat melted cheese on demand. No foodie on earth should be without one of these. It can be used for chocolate, too, so he even has dessert once he’s had enough cheese. They may be common, every day items, but every meal needs a good seasoning to release the flavor, so he shouldn’t be without a good quality condiment set for center stage on his dinner table. This duo comes with a silicone stand, to protect the grinders and keep the table clean. This dish is minimalistic, yet stylish, and would suit any lounge. 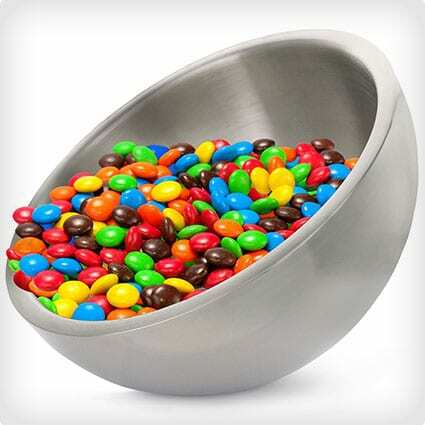 When the journey from the couch to the kitchen is just too far, he’s knee-deep in quality programming, every home should have a candy dish. Whether he fills it with salty or sweet snacks is up to him. With nothing more than this kit and 20 gallons of milk, he’ll have all of the tools needed to make 7 different varieties of cheese. This kit makes the perfect weekend project; the cheese can be made in as little as 20 minutes, which gives him 2 days to polish it off. There’s nothing like waking the family up to the smell of freshly-cooked breakfast. When there’s no time to cook french toast, the house can still smell like it using this scented candle. It’s so realistic, he’ll have to apologize to the wife or kids when they turn out of bed and there’s no toast. Imagine having a trash can that solves two of your biggest grips about storing trash in the home. This can neutralizes even the toughest odors, whilst automatically opening when you approach closely. No more smells, and no more risk of spreading germs around the home. Nobody wants their furnishings tarnished by glass rings, but so many coasters look cheap and tacky. These coasters are made from rounded discs of natural slate, giving his coffee table protection from his glass or beer can, without cheapening his home. This gift basket packs in a whole host of different treats, both sweet and salted. Gourmet chocolates, pretzels, wafer rolls and more, he’ll enjoy these on the couch, in the car, or in the office. Just be careful where you send it, otherwise he might have to share. Every chef needs his apron, and this apron has compartments for everything, from utensils and condiments, to the kitchen sink. He’ll certainly look like the drill sergeant of his own BBQ when he’s wearing this out by the grill. Messy pancakes that spill all over everywhere in the pan are a thing of the past, with this pancake pen. He’ll be able to design intricate batter patterns using the nozzle, which are sure to impress friends or family alike. There’s nothing like settling down to a blockbuster with a bowl of snacks and a cold drink. He’ll appreciate this stack of gourmet popcorn when it comes time for movie night. The case contains 15 bottles, so that’s bound to last him at least a day or two. When things get hot in the kitchen, make sure he doesn’t get burned with this silicone hot handle holder. It slips right over the handle of any pan and makes them much easier to grip, too, whilst adding a stylish touch to his kitchen. Fill his home with the smell of fresh baking bread, and he and his family will be thanking you for years to come. Making the dough is more rewarding than it is hard work, and the end result is a fresher bread with no hidden additives. When he’s creating a feast, he has no time for petty tasks such as opening cans. This machine will do all of the work for him, tearing open his beans, beef, or anything else, whilst he gets busy cooking his dinner. A throwback to Moroccan cooking, this tagine is made for cooking on the stove, and is even imported from Morocco. The authentic tool will guarantee a meal packed with flavor, whilst the dish makes an impressive centerpiece for the dinner table. A great alternative to a slow cooker. Sometimes, the best thing that you can do is to say it with cookies and chocolate. These treats are imported and don’t come as cheap as store-bought biscuits for a reason. Though they’ll make a great morning coffee accessory, they’re best savored after a satisfying meal. If he wants to get the best results and flavor out of his steaks, then he’s going to want to go to town on it with a high quality meat tenderizer. This dual-sided hammer is designed for comfort, will never rust, and has a built-in hanging hook for convenient storage. If he’s the kinda guy who gets hungry whilst on the road, then why settle for a bag of chips and a soda? This portable stove plugs right into the cigarette lighter and can reheat a meal in minutes. The only difficulty will be saving some of last night’s dinner for the next day. With this slow cooker, he’s guaranteed meat that’s tender and delicious, without over-cooking. It also bundles in a “keep warm” setting, in case he wants to go back for seconds. The only downside to this gift is that he’ll have to wait longer to eat. The Swiss army knife is often seen as an essential tool to be carried anywhere. For the true foodie, this is their alternative. Packing a bottle opener, knife, fork and spoon, he’ll never be mor than an arm’s length away from a good meal or a quick snack. Burning your hand on a coffee mug is unpleasant at best, but it’s made even worse when it’s below zero outside, and your hands are already freezing. With a homemade coffee sleeve slipped over his mug, he’ll be safe from chilblains, whilst still cutting through the cold with a warming drink. Where sentiment is an important part of the gift, this DIY breakfast kit fits the bill. You can pack it with pretty much anything you want, but he’ll appreciate having a hearty meal to start the day – or several, if you pack it with enough ingredients. No food lover can resist a jar packed full of brownies. Well, this is a jar packed full of all of the ingredients he’ll need to bake his own. Not only is the presentation awesome, he’ll appreciate the end result far more, when his home smells of freshly baked cakes. A simple, yet thoughtful gift with a killer presentation. Stirring some hot fudge sauce into a hot chocolate is an easy way to slip into a relaxing sleep. Or, he can pour it on just about any dessert. This gift has a bunch of uses and will last him through Christmas and beyond. This recipe is super easy to make. Drop a spoon full of this cinnamon spice mix into a pot full of red wine on the stove, for the perfect mulled wine, or heat it in some apple juice, for a soothing winter drink. Alternatively, he can load it onto an apple pie or Christmas pudding for added flavor. This Christmas, when Santa comes down the chimney, he’s bringing a bottle of wine with him. Crafting him these DIY wine bottle Santa suits will mean that he always has a place to store those expensive wines, during the holiday season. Not to mention, he’ll get a bottle of wine to enjoy with it. Everyone loves Christmas, but the harsh months of sub-zero temperatures that follow can be a tough tradeoff. Help get him through the arctic winter with DIY mason jar soup. For him, it’s as simple as tossing all of the ingredients into a pan for a quick and hearty meal. We’ve put together a list of the best Christmas gifts for married men, a combination of gifts just for him, gifts for him and his wife, and gifts that she will just love to steal. There’s nothing like a good relationship and there are plenty of ideas in this list to strengthen the bond between them. Here’s a unique list of creative gifts for him, ideal for ticking some names off of your Christmas list this year. Some teach new skills, others teach humility, but all of them would make a great choice for any of the men in your life. This Christmas, if you need a helping hand deciding on the perfect gift for the single man in your life, we’ve got your back with this list of 39 practical, fun presents. Whether it be your father, brother, boyfriend, or husband- the well-groomed man in your life with absolutely appreciate any one of these man scaping tools, products, and accessories.